Second only to Mileena, Kitana is one of the most popular female characters in the Mortal Kombat series. Armed with razor sharp fans and femme fatale moves, the MKX version of Kitana has three variations that include Mournful, Assassin and Royal Storm. Kitana has always been known for her trademark fan attacks as well as her sexually provocative appearance. 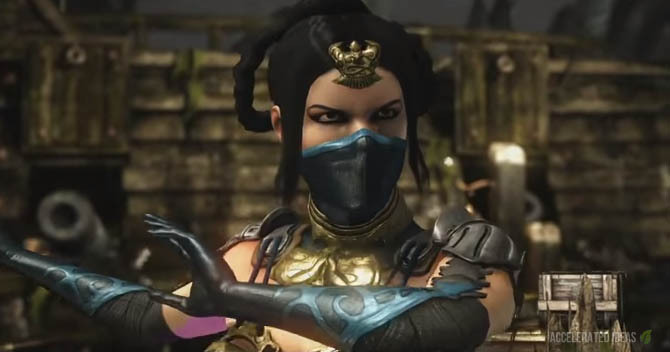 Originally making her debut in MK2 as an overpowered character, the princess has since been toned down in strength and more recently (in MKX) in sexual appearance too - you won't see her wearing any thongs this time around. In MKX, Kitana's moveset includes her trademark fan throws and the amazing fan lift combo-starter to kick things off. In the Mournful variation, Kitana gains both the staff attack and boomerang projectile from Jade (a previous MK assassin character). 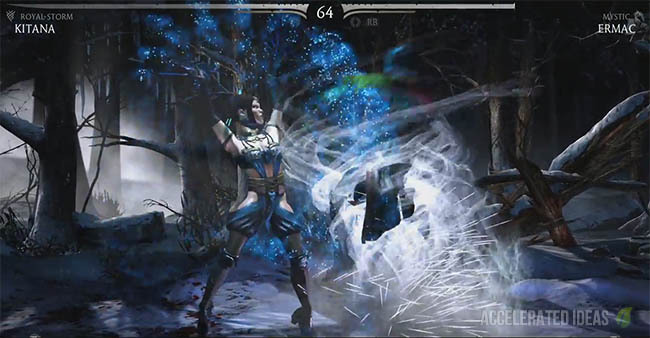 The Assassin version includes a full screen dash-and-stab move whilst Royal Storm is the traditional Kitana move set and plays heavily on the use of the fan as a deadly weapon. Kitana's appearance changes slightly with each variation but the general assassin theme runs through them all. Subtle differences include: blue clothing and glow sticks in her hair when using Royal Storm; darker clothing and black face mask when using Assassin; teal coloured clothing and face mask with a purple glowing mini-staff on her waist when using the Mournful variation. As with other MK games, players can unlock additional costumes for Kitana - some of which bring back the traditional look. I'll cover each of the costumes on this site and guide you through the process to unlock them. A great combo starter, this tornado style attack lifts the other player into the air. Kitana jumps onto the other player, wraps her legs around them and then slices their throat whilst jumping backwards. A fast move when up close. Throw a projectile (fan). A long range attack which can also be used in midair. Enhanced version doubles the number of fans. Watch the video below for an overview of all of Kitana's variation moves, or read on for all the details. A great zoning variation, this is the classic Kitana that fans will remember. Square boost has been a long running move from previous games but the new long range fan lift is the pick of the bunch. The classic mid-range attack, Kitana shifts quickly in midair. Can be used for offence or defence to avoid attacks. A longer range version of the standard fan lift. Kitana spins quickly with fans above her head. This move defects all projectiles. 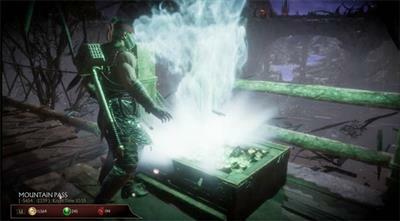 Gains an additional projectile move as well as a new kick and close range staff attack. A fast moving projectile, can be aimed up or down and also used in midair. A lightning fast high kick to the face. Spear the opponent with a luminous purple staff. Gains a knife attack and a simple parry move in addition to bonus damage for all fan attacks via the Sharpen move. Temporarily gain additional bonus damage from your fan attacks. Kitana quickly runs and leaps over the opponent and then drives a knife through their head. Can be used in conjunction with Sharpen for increased damage. Kitana holds up her fans to block incoming attacks dead in their tracks. From mid range, Kitana slices the opponents chest before jumping on top of them, forcing them to the ground. Whilst kneeling on them Kitana slices the opponents head into three pieces using her fan.